The Cross River State Police Command on Thursday paraded a 54-year-old man, Valentine Ebani, for being in possession of the decomposed head of a police inspector, Michael James, who was recently killed in Uyanga, in the Akamkpa Local Government Area of the state. Ebani, who was identified as the chief priest and village head of Uyanga, was arrested along with seven others who were suspected to have killed the inspector and taken his head to the village shrine. James was killed and beheaded in Uyanga on December 25, 2017 during a communal clash between Uyanga and neighbouring Ojor, both in the Akamkpa LGA. The communities had in recent times been involved in violent communal clashes that had claimed the lives of several persons, while property worth millions of naira was destroyed. James, who was attached to the Special Anti-Robbery Squad in Enugu, had taken his family on a visit to his in-laws at Ojor village when he was beheaded by rioting youths in Uyanga. The state Commissioner of Police, Mr. Hafiz Inuwa, said the late policeman had visited his in-law, ASP Dominic Umoh, in Ojor village when the incident happened. “While buying fuel, Uyanga youths, without provocation, attacked, killed and beheaded him. His corpse has yet to be found. However, his severed head has been recovered at Uyanga shrine. “The youths also seized the late inspector’s AK-47 rifle, with double magazines and set ablaze his Toyota Sienna, with number plate, ENU 683 NK,” he said. 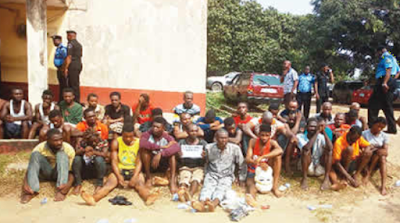 Inuwa said police investigation led to the arrest of Isaac Akpan, Benjamin Abakum, Patrick Edet and Famous Archibong. Other suspects are Effiong Odu, Ndifon Arong and Wisdom Inok. The police boss said items recovered from the suspects included one locally-made pistol, 17 empty cartridges, underwear of the deceased and one human skull. The commissioner also said the command arrested no fewer than 529 suspected criminals during the festive period.